Each of the past few years has served up a geopolitical ‘crisis du jour’. Today, the investment world is fixated on the risks that a belligerent North Korea (NK) presents to the world. Our aim is not to sound an artificial note of calm, nor is it to appear sanguine to the myriad and complex risks facing markets. Rather, we’d like to use this article to have a logical, balanced discussion on the risks as we see it as relating to NK and how these views help shape RiverFront’s portfolio construction in an age of geopolitical uncertainty. 2017 has seen a general escalation of threats coming from NK, wrapped in a series of weapon tests. According to the recent declarations by the Pentagon, NK will be capable of fielding a nuclear-capable ICBM (intercontinental ballistic missile) as early as 2018. In response to the toughest sanctions yet from the UN Security Council last week, NK responded this week with typical bellicose threats. President Trump, never one to back down from incendiary comments, responded with the following quote: “NK best not make any more threats to the United States…they will be met with fire and fury like the world has never seen.” Since then, there has been a flurry of specific threats from NK with regards to US military bases on Guam, a stern condemnation from South Korea and Japan, Trump and NK both doubling down on aggressive language, and, finally, China suggesting they’d stay neutral in the conflict unless the US attacked NK first. With geopolitical risks rising and US markets sitting near all-time highs in an otherwise slow summer news cycle, market jitters are understandable. Markets may become more volatile before the summer is over. We at RiverFront are not national security experts nor do we pretend to be; instead, we are experienced investors who try to apply rationality and a careful study of history to our portfolio construction. Our view is that the current hostilities are not likely to result in catastrophic military action (For readers who want to dive deeper into our views on how we arrived at this conclusion, please refer to our Appendix section below). We are encouraged that our benign outlook is supported by the price action in bond markets – US and global bond yields have been relatively calm (the 10-year treasury traded between 2.19 and 2.26%) during the equity market volatility spike last week. Sovereign debt credit default swaps (CDS) tell a similar story; for South Korea’s CDS market, the country theoretically most at risk, spreads are elevated off of multi-year lows reached in late 2016, but still well off the highs of 2012 and 2013. The overall backdrop for risk assets is still encouraging in our opinion. As we have discussed in prior articles, synchronized global economic growth is still solid, central banks still accommodative, European political risk continues to drop and corporate earnings for the second quarter were strong globally. We dive deeper into our analysis of the North Korean situation in an Appendix, but first allow us to make a broad statement backed by historical precedent: Trying to time broad defensive turns in investment strategy around perceived geopolitical risks has historically not been a winning investment strategy. Looking back across 80 years of market data, we find very few major geopolitical events, despite their political and cultural significance, actually led to market losses in both the short term and long-term. According to a New York Times article from May, in the last 100 years, only the Nazi invasion of France in May 1940 led to US market losses across a one-week, three-month, and one-year forward period. Even JFK’s assassination had no negative impact on US stocks looking a year forward. Sustained bear markets have been mostly associated with recessions, or periods of elevated inflation. Their magnitude tends to be determined by how overvalued the market was at the start, and by the severity of the recession. We therefore believe that, in the developed world, economic and corporate fundamentals along with central bank policy are the prime determinants of future market direction over the intermediate term, with asset valuation being the single most powerful long-term determinant. An insightful study published this spring by Charles Schwab’s investment strategy team suggests that taking risk off in global markets in response to armed conflicts and military regime-change operations in the past has rarely been a good idea in the near term (see table below). Obviously, the difference between today’s situation and many of the instances above is the potential for NK to strike back militarily in areas like South Korea, Japan, and (supposedly) even US territories. To this end, Schwab analyzed two very specific events in US history as analogs: the Cuban Missile Crisis in 1962 and the Iraq War in 2003 as analogs – both involved ideological differences and a concern over weapons of mass destruction (WMD). 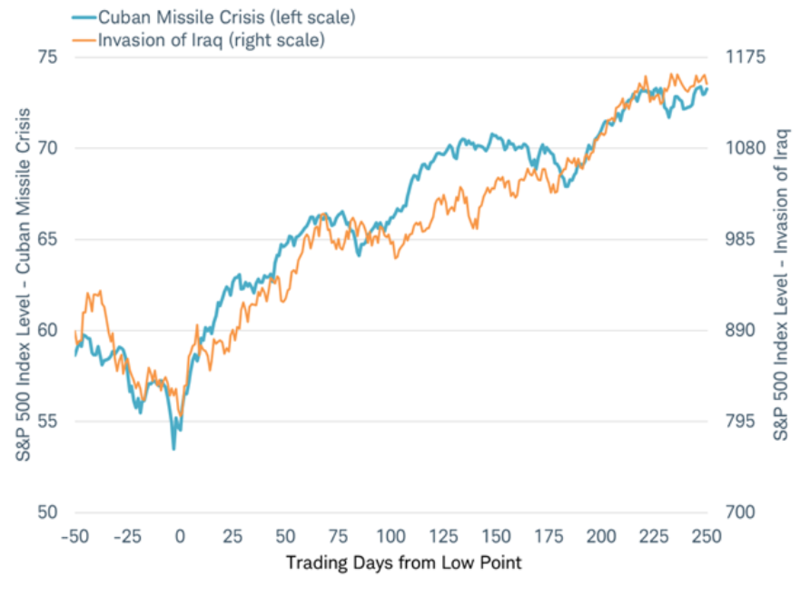 While stocks suffered in both instances as geopolitical tensions rose in anticipation of action, in both cases the market rallied when the US actually took action (military blockade of Cuba, invasion of Iraq – see chart below). Source: Charles Schwab, Bloomberg data as of 4/13/2017.Past performance is no guarantee of future results. In our opinion, the single most important decision made by a client with their advisor is to understand what they want their money to do, and how much volatility and short-term loss of principal they can tolerate without causing an emotional decision. History shows unambiguously in our view that emotional decisions driven by fear or greed are rarely optimal and often damaging. Strategic asset allocation is best made in a calm state of mind and with an agreed set of objectives; and should take current market prices and yields into account. Today an investor must weigh the potential volatility of stocks against extremely low risk-free returns; and thus the considerable long-term risk of holding cash yielding less than the Fed’s target inflation rate of 2%. Corrections and bear markets are stress tests of both the plan and our emotional response to the events that trigger downturns. If we are right, this war of words and threats will be just another stress test on our emotions. That said, following a well-above-average year for stocks globally, we think this is an excellent opportunity for investors whose portfolios may now be “over-risked” to discuss a re-balance with their financial advisor. A rational analysis of the N. Korean situation leads us to the conclusion that war is unlikely, and therefore that any correction in stocks will not de-rail the primary uptrend. We have a risk management plan if we are wrong. We suggest readers discuss with their advisors how much ‘heartburn’ events like this give them, plan their strategic asset allocation balancing those feelings against the high opportunity costs that a strategic cash position entails. In our opinion, it makes sense that NK is vigorously pursuing nuclear capability – in modern warfare, nukes are the great ‘equalizer’. Nations of dubious industrial infrastructure and stability still get a ‘seat at the table’, per se, when they have weapons of mass destruction (“WMD”). North Korean leadership can point to the recent failures of el-Qaddafi and Saddam Hussein to retain power as ‘cautionary’ tales for what happens if brutal dictators give up their weapons. 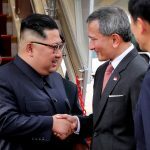 The common description of Kim Jong Un as a petulant boy-dictator with an appetite for chaos is likely too simplistic; in fact, nuclear proliferation sadly makes ‘sense’ for a poker player with the mindset and cards he currently holds. Remember that NK has a long and rich history (dating back to Kim Jong Un’s grandfather, the founder of modern-day NK) of belligerent statements, followed eventually by attempts to secure concessions from its enemies. In this regard, Kim Jong Un is simply following a time-honored NK playbook, albeit on steroids. The ultimate success of Reagan-era Cold War policy suggests that continuing to increase US military presence in Asia is probably the right long-term strategy to deal with this threat, not throwing the first punch. Bullies ultimately respond to strength, not diplomacy…but retaining the high ground is also important to secure world support for any potential action. We think it’s important to keep in mind the role that China plays here: Simply put, it is well within China’s grasp to end the belligerence of N Korea. This is for the simple fact that N Korea as a state is impoverished, incredibly unstable and almost totally reliant on Chinese economic support. Our belief is without implicit Chinese support, the state of NK would collapse in short order. So, why does China support NK at all? 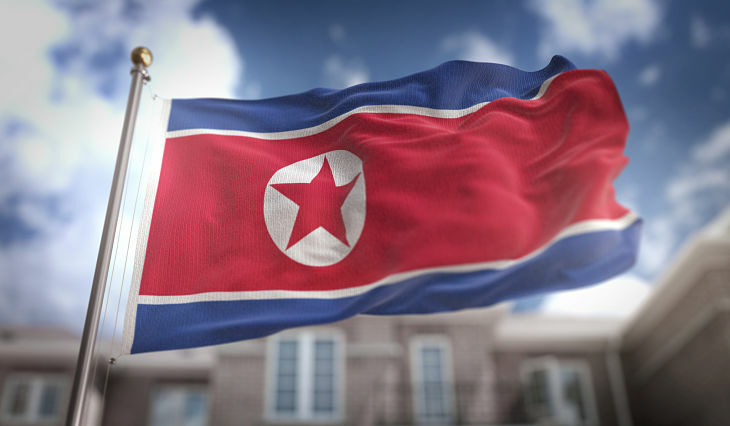 We believe it’s partly because NK serves as a useful geographic buffer between China and democracies like South Korea, NK’s role as a bargaining gambit that China can use to extract concessions out of the US over trade policy and military presence, and partially because China fears the refugee ramifications of the collapse of NK. Also, the power vacuum that would be created by a NK collapse could very well eventually result in increased South Korean and Western influence in the region – not something that China wants. The US is right to apply pressure to China to help with a problem that has the ability to negatively affect China as much as the West. China’s participation in the recent UN Security Council sanctions is a good start, but more is needed. With respect to China’s view on NK, we think it’s instructive to think in terms of game theory; is China’s current cultural and economic relationship with NK meaningful enough to risk engaging in a major military conflict with the West and its allies? We believe not, at least not currently. How averse is China to a NK collapse? This would not only plunge some of China’s most important export markets (South Korea, Japan, and even Europe and the US) into varying degrees of economic uncertainty, but also create a massive refugee crisis on China’s borders, something China would desperately like to avoid. 2017 is a political year for China – this fall, Communist party leadership transition happens on a meaningful scale during the 19th National Congress, a once-every-five year event. Ahead of a leadership transition, economic and cultural stability, and a show of power and order is tantamount for the Chinese to project. So, is China ready (as a military force and as an economy) to wage outright war with the U.S and its allies? We don’t believe that China has (yet) reached the level of self-sufficiency as an economy for that to make any sense at all from the Chinese perspective (the open question for the next few decades is whether this calculus changes if/when China fully transitions to an internally-driven consumer economy) . It’s reasonable to expect that, out of the limelight, there are conversations happening between the US and China on how to limit potential fallout as it relates to NK. BUT… WHAT ABOUT IF NORTH KOREA ACTS AGAINST CHINA’S WISHES? Of course, NK can act unilaterally even against China – if the current regime is truly suicidal. Are they? Kim Jong Un by many accounts does not behave like a theocratic zealot in the ISIS mold, whose public aim is an apocalyptic end state, preaching the rewards of the afterlife to his zealots. Rather, Un by many accounts is a ‘kleptocrat’ who enjoys his NBA basketball, expensive cigars, brandy and Mercedes….all very worldly desires. NK, like most kleptocracies, are driven by an overriding desire to crush internal dissent, survive and stay in power at all costs. That suggests brinksmanship with nuclear proliferation, versus a suicidal approach to setting off WWIII.